Which is the coolest museum exhibit you have been to? The Rain Room personally tops them all for me currently. It is one of the most interactive exhibits I have experienced and I have been to a couple of cool ones including Yayoi Kusama's 'Fireflies on Water' and Ann Hamilton's 'The Event of a Thread'. In the Rain Room, heavy rain drizzles down in a quite sizable room equipped with motion sensors which detect your presence and will shut the water right above you as you walk through the room and let you stay completely dry (with a few drops here and there of course!). Completely camera and cellphone safe in the rain! 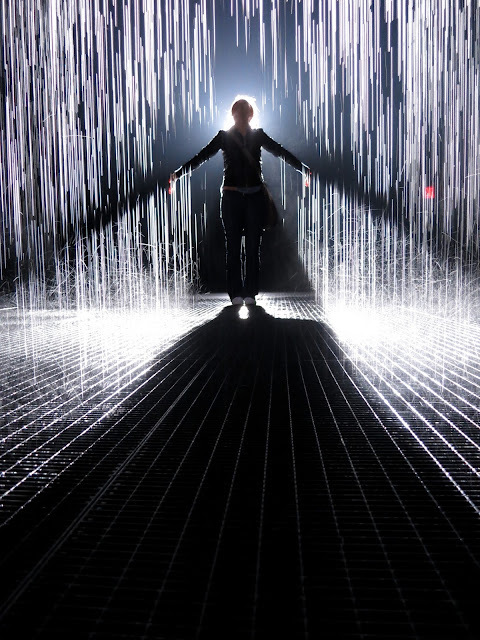 The Rain Room is on exhibit from May 12 to July 28th but you have to go NOW. As the popularity of this exhibit increases, so will the wait time to go in. When the exhibit was in London, the wait was up to 8 hours. We were able to bypass the line as member's guests and still wait a little. We could not be more grateful for the group of people in front of us who decided to purchase the membership and allow us to be their guest for $5...we had already waited for 45 minutes and were barely moving down the line. The people in the front of the line waited almost 2 hours and it was only the second day of the exhibition. They allow up to 10 people into the Rain Room however, the staff kept saying they were letting 6-7 people in at a time to let people feel the maximum effect of this unique exhibit. There is no time limit for each person and photography is highly encouraged. Every picture you will take will look amazing! I posted a few we took! For more info about the exhibit, click here. Taking pictures while waiting in line inside the building...Click below for more pics. Trying to lick the rain but can't!! Thank you- stranger who took a good 3 minutes finding the best angle to take a shot of us while we smooched away. Total PDA for this shot. Apologies! Looks awesome! I tried to stop in a couple times, but 2 hours is such a time investment! Is it worth it? So we got lucky because a group in front of us decided they didn't want to wait and got the membership and let us be their guests for $5 so we skipped the line. If you go with a big enough group- say 5-6 people, then one person can get a membership + $5 guest passes up to 5 people and then split the cost amongst everyone. So for 6 people, it would cost less than $20/person to see the rain room (or even cheaper if a student membership was purchased $50), skip the line to wait just a bit less long.